The Raving Queen: Could The Proposed R Train Repair Unleash A Living Horror, Like The Che Che Bugs In "Rodan????????" 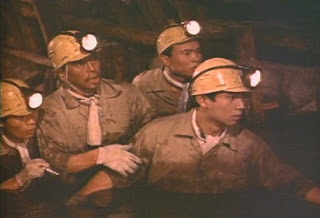 Could The Proposed R Train Repair Unleash A Living Horror, Like The Che Che Bugs In "Rodan????????" Girls, especially those of you who ride this route, you have to think about this. It was not until they started digging deep into the mine tunnels, in the movie "Rodan," that the Che Che Bugs were discovered.!!!!!!! And, once that earthquake hit, digging even further, and trapping Shigeru, it helped unleash Rodan himself, whom Shigeru witnessed hatching out of the egg. Now, I don't know if there are giant insects or a mutant pterodactyl underneath these tunnels, but I would be very careful about how far I dug. There was this horror comic story I read, set in New York City, where, at night, a giant reptilian claw would crawl out of city manholes, and attack people. Now, THAT I can believe!!!!!!! And, no darlings, it is NOT Christine Quinn!!!!!!!!!!!! She couldn't even fit into a city manhole!!!!!!!!!!!!!!!!!!!!!!!! It is bad enough R train riders will be subjected to the horror of discomfiting commutation. They should not have to contend with a horror from the unknown!!!!!!!!!!!!!! Remember, darlings, it is not nice to fool with Mother Nature!!!!!!!!!!! She has a nasty way of striking back!!!!!!!!!!!!!!!!! Maybe some of us will have to commute with an enlarged bug sprayer, like what they used in "The Wizard Of Oz!!!!!!!!!!!!!!!!!"